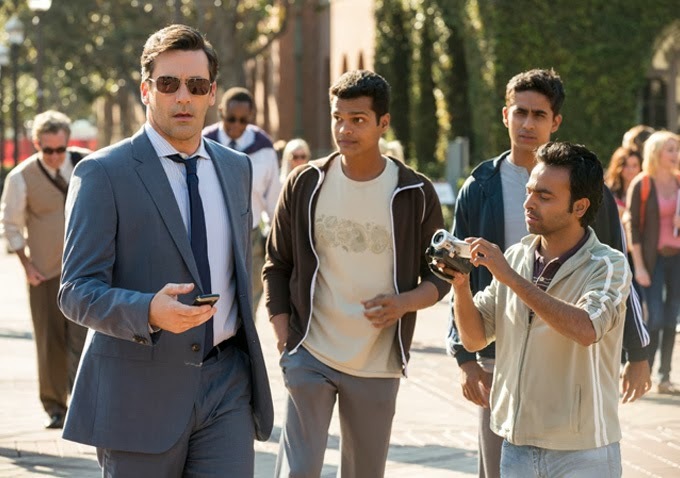 The comedy-drama "Million Dollar Arm", an odd addition to the Disney catalog, is based on the true story of a struggling Los Angeles sports agent whose "Million Dollar Arm" contest yields two Indian-born pitchers, the first from the country to sign a contract with a Major League Baseball team. Craig Gillespie directs Jon Hamm as J.B. Bernstein, the real-life agent who sees dollar signs and not people, whether those people are alive or dead. Brusque, abrasive and cold, Bernstein has little patience for anything or anyone that gets in the way of a deal. "Maybe that's the way I am," he says. "Million Dollar Arm" features the clichéd cultural gulf between Americans and anyone who isn't, the irascible old man (Alan Arkin), the woman next door as potential love interest (Lake Bell, who incidentally, is good here playing the voice of reason, if not the most genuine character.) Last but not least there's the constant caricatured racial stereotypes of Indians, one of the most distasteful aspects of Mr. Gillespie's film. Worse still are the shallow, unbridled racist assumptions of two of the film's white characters, J.B. and Brenda (Ms. Bell). Some of their sentiments are right in line with Donald Sterling's. On the one hand it is actually comforting to know that a film doesn't varnish its characters' racist views for sanitization or audience comfort. The film "42" tried too hard to do so with some of its white characters last year. "Million Dollar Arm" manages to at least attain a reality to racist responses both "benign" and harsh within the context they exist, especially in 2014 America. On the other hand I felt little heroism, Disney magic or triumph in anything Bernstein did. There's no spark or energy in "Million Dollar Arm" overall due in part to those racist views and the lack of freshness or ambition in a film that aspires to celebrate the human spirit but falls far short. The inevitable triumph of two cricket-loving Indian baseball pitchers, one of whom returned to India never to pitch in the U.S., and the other who pitched in the Minor Leagues, was drawn out and flat, in a film running more than two hours that should have been 30 minutes shorter. "Million Dollar Arm" tries awkwardly to play stereotypes about Indians for laughs but it is all a spectacular failure. The Indian characters speak in a way that sounds demeaning, exaggerated: anything but genuine. Treated as surface beings, artifacts, servile, moochers and plastic, smiling ornaments, their feelings and needs are held at a distance. They are pawns in a game of money and baseball, with an indifferent white male holding the strings. I couldn't help but think of Donald Sterling throughout. "Million Dollar Arm" makes the time-honored mistake of believing that as a sports agent Bernstein and Bernstein alone knows what is best for the men from India. At times Bernstein barks at them and treats them like something akin to prized slaves. All of the film's characters are anchorless. Any black characters are mute. Asian characters are ceremonial. A woman who is a researcher and secretary to Bernstein is almost always background fodder, hidden away behind men and cut out of shots as if under quarantine. Even some of the white male pitching scouts who follow the pitching progress of Dinesh (Madhur Mittal) and Rinku (Suraj Sharma) are a herd of cynical sheep who march in tandem. It's a sad, bewildering spectacle. This film could, and should, have been better than its trailer appeared to teasingly suggest. I don't think "Million Dollar Arm" ever set out to be an embarrassment or in some ways a racist mess. Few of its scenes spoke to the desires, fulfillments, humanity and needs that the Indian characters may have had, whether any of those were independent of the Bernstein character or not. "Million Dollar Arm" treats the self-deprecating Indians as commodities rather than full-blooded characters. Perhaps I shouldn't have expected much from a PG-rated movie, yet such rated films are often the place where the most pernicious subtexts and damaging messages are sent. The worst aspects of characters don't need to be redeemed. They need only be displayed, without further buttressing their justification by coupling them with stereotypical and one-dimensional Indian characters. With Bernstein and "Million Dollar Arm" Mr. Gillespie and writer Thomas McCarthy want to eat their cake and keep it too. They suffer a severe case of indigestion, intestinal, racial and film-wise. Also with: Aasif Mandvi, Pitobash, Allyn Rachel, Jarwan Jariwala, Ray Maualuga, Gregory Alan Williams. "Million Dollar Arm" is rated PG by the Motion Picture Association Of America for mild language and some suggestive content. The film's running time is two hours and four minutes.